yesterday i finished my grey loop shawl. i had made the same last year for a friend, (i didn't follow a pattern for this one, just cast on 14 stitches and went on in stockinette stitch, which intentionally lets the ends curl. later i sewed both ends together). and i don't know yet if i will keep this one or not. it's really warm, chunky merino yarn and the loop fits around my neck three times for outdoor wear. i still have 4 skeins of that yarn left, and we are planning a giveaway to celebrate a milestone in etsy sales soon, so look out for that! i am wearing my first shalom, handknit mitts and a handmade jersey beanie. my reading - you might have guessed - is still the same. Mr. Penumbra's 24-Hour Bookstore but i am quite far in the book by now and can say that it is a really good read! i'm sure i'll finish it by the weekend. which is good because i have a stack of books i am planning to read during the holiday break. also pictured is my Mairéad hat of which you can see the pattern a bit. i hope the yarn lasts for this one otherwise i will have to get creative. 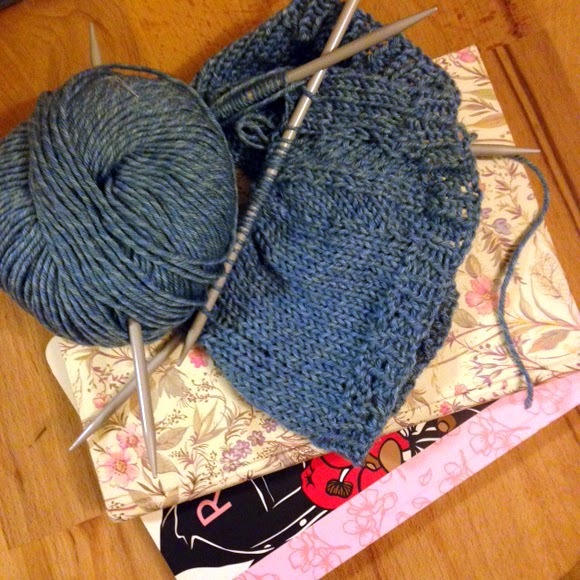 what are you knitting and reading this week? looking forward to catching up! joining ginny of small things. Love the grey loop shawl, it looks warm and cozy. Are you wearing a Shalom with sleeves? It looks great! love the shalom. That has been in my queue forever!